This introductory chapter describes the reality of climate change and its causes. It begins with a personal account of experiences, progresses to a societal perspective, and ends with a technical appraisal of the phenomenon. 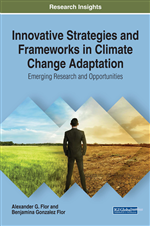 Experts characterize climate change by weather extremes, uncertainties and variabilities. The authors express their difficulty in appreciating the arguments of climate change deniers when their experience of the world constantly reminds them of these realities on a month-to-month, week-to-week, or even day-to-day basis. The authors give a non-technical description of the causes of climate change and argue for the anthropogenic view that it is caused by man, citing findings of the Intergovernmental Panel for Climate Change. They reiterate the assertion that climate change is both inevitable and irreversible. It is Christmas Day of 2016 and, for us, it is a Christmas like no other. Our extended family which includes our children, their spouses and our grandchildren decided to celebrate this most joyous of holidays indoors to shield ourselves against Typhoon Nock Ten, a Category 4 tropical cyclone that was about to plow through the country’s midsection, its eye missing the university town where we live by forty kilometers. This distance may be considered far, but not far enough. Meteorologists categorize Category 4 cyclones as Super Typhoons along with the Category 5, which, as of two years ago, was not even part of the classification system for storm warnings. The typhoons that traverse the Philippines are getting stronger breaking the upper limit of what was regarded as extreme for so long. Moreover, for most of our lives, the typhoon season ended in October, when cooler air from the northeast signals the arrival of Amihan, a season of moderate trade winds and slight rainfall. Nowadays, the storms stretch into December. Last year, 2015, Typhoon Melor came in the middle of that month. This year, the storm waited until the last week, Christmas Day to be exact. Our typhoons are not only getting stronger. They are occurring at unusual times. Experts submit that climate change is characterized by weather extremes, uncertainties and variabilities (Cardona et al., 2012; Solomon et al., 2007). In late March 2014, we were in Bangkok as the Thais were preparing for Songkran, the New Year festival. This Songkran was quite different from those of previous years. Up north, the mango trees had already bloomed off-season while in Bangkok acacia trees were shedding-off their leaves prematurely. Songkran is celebrated not only in Thailand but in other countries in the Greater Mekong Subregion as well. In Laos, people call it Pi Mai, traditionally one of the hottest times of the year. In 2014, ambient temperatures in Vientiane shifted from 8 degrees Celsius in February to 36 degrees Celsius in March. It was so cold in the Northern provinces in late January that classes had to be suspended. Barely a couple of months later it has become so hot that you would welcome the cold water that Pi Mai well-wishers douse on you. For a tropical country that has known only two seasons, the rainy and the dry, this abrupt shift was most certainly a manifestation of climate extremes. In many cases, climate extremes, climate uncertainty and climate variability would wreak havoc, especially to populations in vulnerable countries (Flor, 2016). The 2014 Vulnerability Index of Germanwatch named the Philippines as second most prone to climate change disasters after Bangladesh (Vidal, 2013). Typhoon Haiyan that struck Leyte province in November 2013 influenced that determination in no small measure. A visit to Tacloban, Leyte in November 2014 left profound impressions on both of us. One year after the storm surge that ended thousands of lives and destroyed billions worth of property, there was a feeling of resignation among the living. Yet, indescribable emotions of anguish, despair and sorrow lingered on. Climate change deniers would argue that tropical cyclones have plagued the Philippines since time immemorial (Comiso et al., 2013). Yes, indeed. However, these storms hardly encroached upon unprepared communities in November and were neither nearly as strong nor as destructive as Haiyan. It is difficult to appreciate the arguments of climate change deniers when our experience of the world constantly reminds us of the contrary on a month-to-month, week-to-week, or even day-to-day basis. It is no longer a matter of convincing ourselves that our climate is changing but a matter of responding appropriately or adapting to survive.